Notes can be exported using the "Export Notes" command on the File menu. 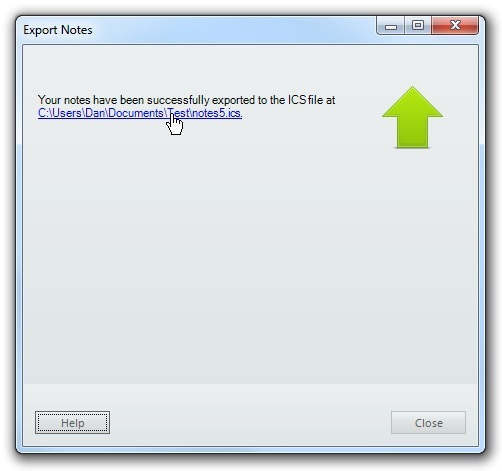 Notes can be exported to CSV files, Microsoft Outlook, Microsoft Excel, or iCalendar (ics) files. 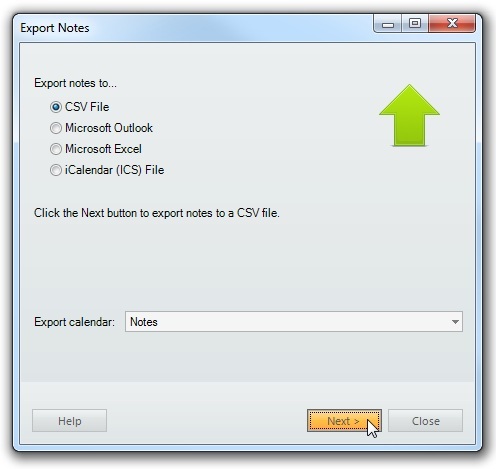 All notes associated with the calendar specified in the "Export calendar" field will be included in the export. If you have multiple note calendars, you can select the desired calendar from a drop-down list. When exporting to a CSV file, a window will appear enabling the export file name and location to be selected. If an existing file is specified, you'll be prompted to confirm overwriting the file. After specifying the file name, click the Save button. The notes will be exported and a message will appear when the export is finished. A clickable link will be included in the message, in case you'd like to open the exported csv file. Otherwise, click the Close button to close the Export Notes window. 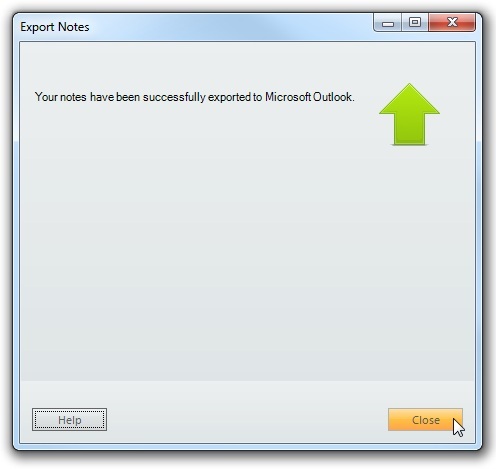 Notes can be exported to the "Notes" folder of Microsoft Outlook 2010 or later. To do this, select Microsoft Outlook as the export destination and click the Next button. This may take a few seconds. When the export is completed, a message will appear and the window can be closed. 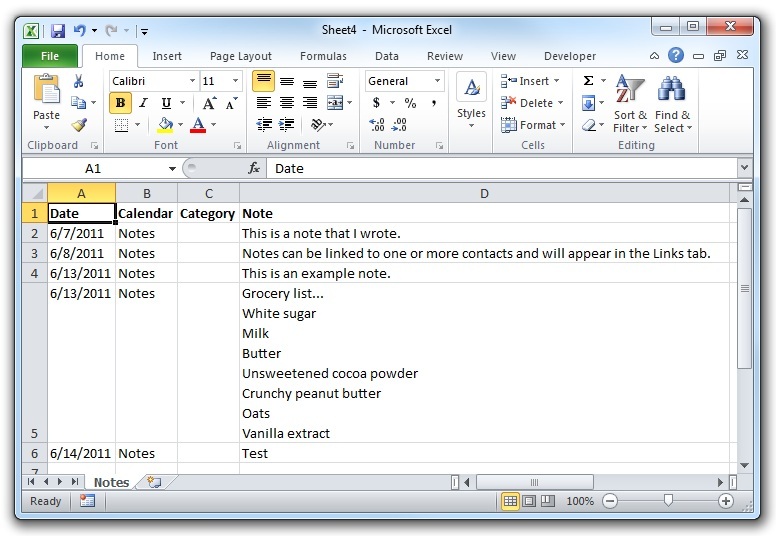 Notes can be exported to a Microsoft Excel spreadsheet. To do this, select Microsoft Excel as the export destination and click the Next button. This may take a few seconds. 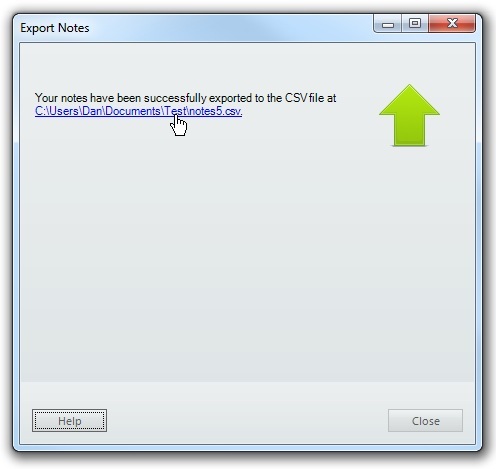 When the export is completed, a new Excel workbook will be displayed containing the note data. The columns will include the note date, calendar, category, and details. The details will be converted to plain text. Notes can be exported to iCalendar (ics) files. The notes will be exported as "VJOURNAL" entries. These may or may not import into other calendar programs, since the VJOURNAL extension of the iCalendar file standard is not widely used. However, VueMinder fully supports importing VJOURNAL entries and you could use the Import Notes command in VueMinder on another computer to import your notes. When importing into VueMinder, all details of the notes will be included, such as text formatting and the pinned date. When exporting to a iCalendar file, a window will appear enabling the export file name and location to be selected. If an existing file is specified, you'll be prompted to confirm overwriting the file. After specifying the file name, click the Save button. The notes will be exported and a message will appear when the export is finished. A clickable link will be included in the message, in case you'd like to open the exported ics file. Otherwise, click the Close button to close the Export Notes window.